I used to chuckle smugly whenever Liam wrote an article about yet another game that launches on the wrong monitor. That was never an issue for me on my single monitor set up, so continual woe for him was continual wry humour for me. But in April this year, I did my first PC upgrade in over five years. It was a big upgrade, featuring both an epic graphics card and a shiny new Acer Predator monitor. But now I had a dilema... what do I do with the old 22" monitor I was using beforehand? You guessed it, I connected it up and placed it off to one side, the better to keep Chrome and Steam in view while gaming. And of course, I immediately joined the "Wrong Monitor" crowd. If I'd known how frustrating this was, I'd have kept that smug grin off my face earlier. Clearly, karma likes to hit schadenfreude when it's down and Liam can consider this article my written and profuse apology. But while that largely worked, it didn't stick between reboots, even when you hit "Save to X configuration File". It saved, but the tick always reverted to the wrong monitor regardless. Infuriating! But that led, eventually, after far too much googling, to a potential solution. It's courtesy of this Ask Ubuntu answer, which I'll summarise here too. It's really straightforward. 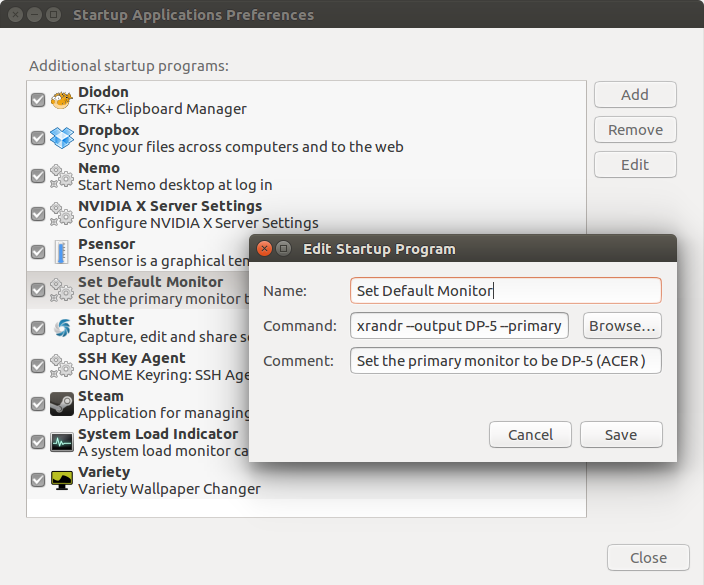 In fact, if you already know the device names of your monitors, you can skip straight to the final step! ...and note the name of the monitor you wish to be primary. For me that was DP-5. As noted in the original article, you can easily put that exact command into your Startup Applications directly to run this every time you log in to your PC. For me, problem solved. If this works for you, be sure to upvote Etron's answer on Ask Ubuntu! Delete the original - the next step will recreate it anyway. 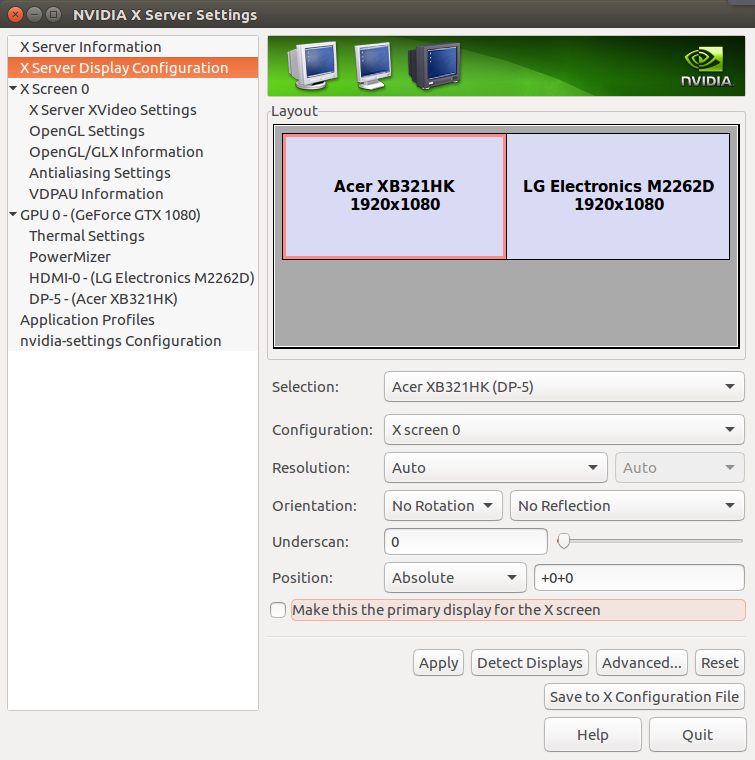 Open your system's control panel and choose displays (or in Ubuntu's case, run unity-control-centre display), then hit "apply" to create a new monitors.xml. You can open this file in a text editor (such as gedit, geany or nano) and just make sure that only one of the entries has a "yes" against its "primary" field. ...to one of your "Monitor" sections! But if all else fails, or if you don't like the idea of running xrandr in a startup script on every login, maybe this will work for you. BTRE's note: The above is in /etc/X11/xorg.conf.d/10-monitor.conf The important bits are "Primary" and the positioning "RightOf", the rest is just stuff that may not apply to you (I prefer not to use DPMS and have a TV hooked up on HDMI I'd rather not get used until needed). This is just stuff you can find out more about in the Arch wiki. If you have an alternative and/or bulletproof method, please (please!) share it in the comments. But so far, for me, the xrandr procedure I outline here has worked a treat. This is very informative and should help others who have this dual-monitor issue. Thanks. I have had to use this as well when running a 120hz monitor and a 60hz. I find that KDE's display configuration works pretty well. But for awesome I had to set up my xorg.conf.d correctly. Note that for outdated Xorg versions you don't have to specifically configure device and screen, but for an up to date Xorg they will need to be configured correctly. I have my personal setup up on GitHub for reference. I did put in bold that this was a very custom config, but since it's another approach to the whole problem, I thought it was worth sharing. I'm no expert on xorg.conf though. I'd usually search the Arch Wiki for relevant stuff, to be honest! I might run Ubuntu, but that wiki is an absolute mine of useful information (e.g. https://wiki.archlinux.org/index.php/multihead#Configuration_using_xorg.conf)! Wait ... so you don't have that issue there ? Never used i3 so curios. Such retarded fanboy posts are what makes me wish we had an up/downvote system instead of an "abuse-safe" likes one. razing32 Wait ... so you don't have that issue there ? Never used i3 so curios. You don't have that cause in tilling wms every worksplace is dedicated to a single monitor (but you can have any number of workplaces regardless) so as long as a window is launched in or moved to your desired workplace there's no way it would show up in the wrong one.